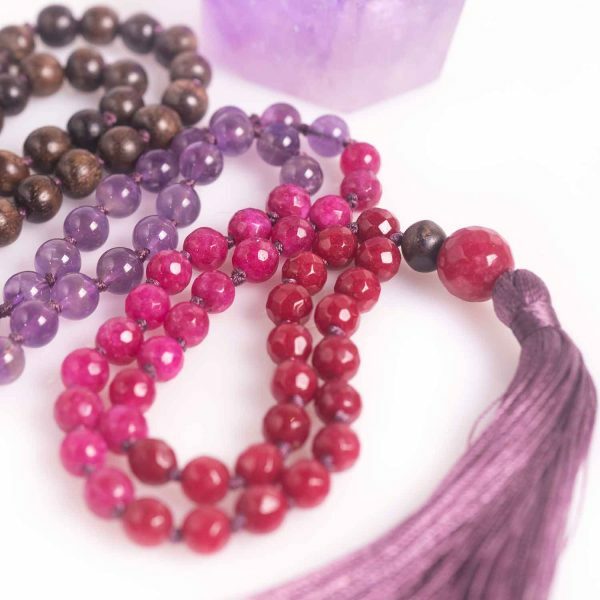 View cart “DARE TO BEGIN MALA BEADS” has been added to your cart. 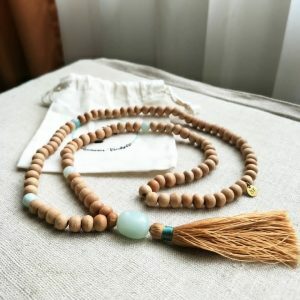 Tibetan style mala necklace, ideal for yoga, counting mantras during prayer or meditation. 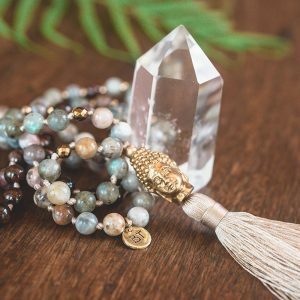 This mala is a beautiful reminder that the most important journey is journey to ourselves. Deep within each of us rests the power and knowledge that we need so much in our everyday life. 108 mala beads, hand knotted with 6mm red and pink faceted Ruby beads, 6mm smooth Amethyst and genuine brown Tibetan Agarwood beads. Beautiful ombre necklace is completed with 10mm faceted red Ruby guru bead. 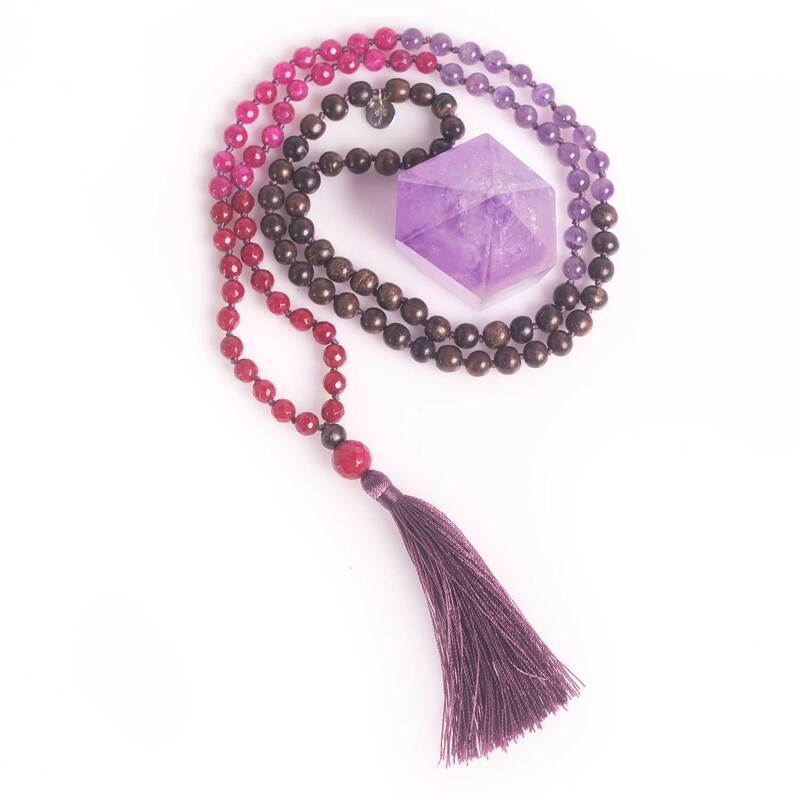 Beads are knotted with good quality nylon thread and finished with aubergine dark purple tassel. 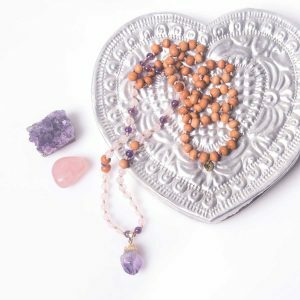 Tibetan style mala necklace, ideal for yoga, counting mantras during prayer or meditation. 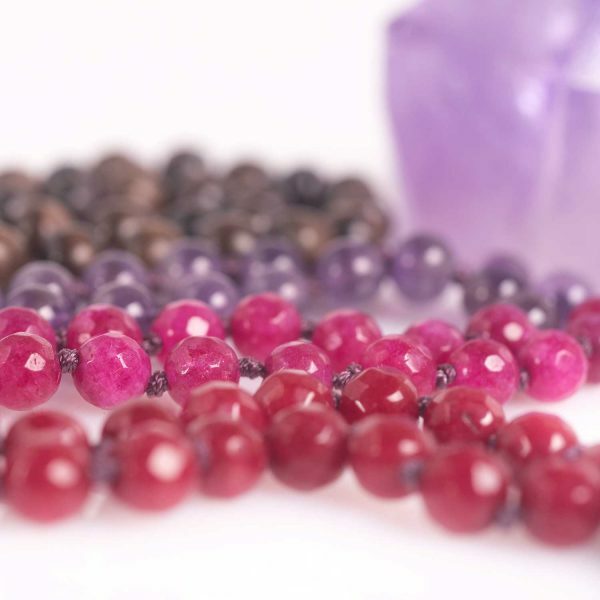 Ruby encourages passion and inner strength. It improves motivation and setting of realistic goals. Ruby’s intense energy sharpens the mind, bringing a heightened awareness and excellent concentration. Balances the heart and instills confidence. Amethyst is a powerful and protective stone with a high spiritual vibration and it’s extremely beneficial to the mind, offering calming energy. When you meditate, it turns thoughts away from the mundane into tranquility and deeper understanding. Amethyst has been a symbol of peace, purity and unification and can aid in bringing serenity and calmness. Agarwood is suggested by skilled practitioners for offering the essential devotion and motivation for meditation. It is used for spiritual journey, enlightenment, clarity and grounding. Agarwood raises sense of peace and strength, relieves anxiety, bring alertness and expels negative energies.